Into the Collection offers readers a sneak peek into the McMullen Museum’s permanent collection. The work(s) described in Into the Collection articles capture a snippet of what was discussed at recent Into the Collection events, where guests are invited to the Museum to look closely at rarely-seen works from the permanent collection and discuss them with Museum staff. This past December, I had the opportunity to present a painting at an Into the Collection event focused on nineteenth-century American painting. The McMullen Museum owns six of Walter Franklin Lansil’s paintings, and I selected his work titled Venice Crossing to The Giudecca. This particular work was painted in 1884 while Lansil was in Europe. Although Lansil was a native of Bangor, Maine and later a resident of Boston, a sizeable amount of his maritime paintings were created during his brief travels in Germany, France, Holland, Italy, and various other European countries. One of the most striking features of this painting is Lansil’s use of cool colors in both the sky and sea. Additionally, the island of Giudecca in the Venetian lagoon is seen in the distance with the iconic cathedral, Il Redentore, appearing just over the horizon. 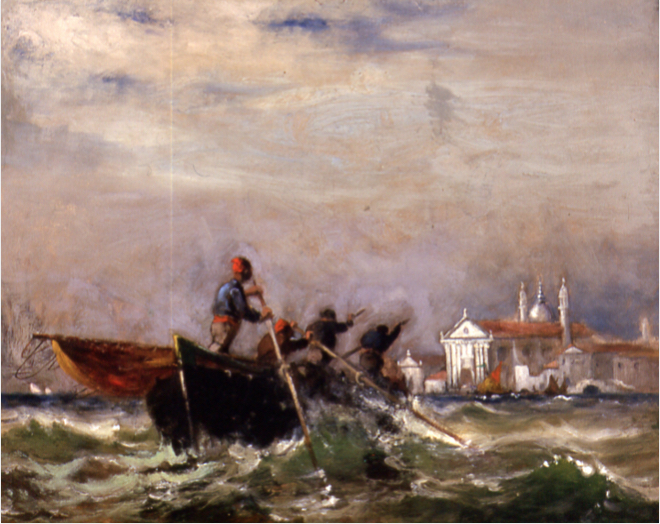 Lansil’s distinct style is exemplified in this specific piece through shading, atmospheric effects close to the horizon line, the reflection of light on the choppy waves of the canal, and the employment of warm colors that draw the viewer’s eyes to central points such as the roof tiles of Il Redentore and the rower’s hats.